ROSEVILLE, Calif. — Todd Gilliland started the season with a historic winning streak, and wrapped it up Saturday night with an eighth-place finish that was more than enough for the teenager to add to the record books. The 16-year-old from Sherrills Ford, N.C., clinched the NASCAR K&N Pro Series West championship with his 13th top 10 in 14 races. Meanwhile, Ryan Partridge outlasted defending series champion Chris Eggleston and NASCAR Next driver Julia Landauer in a green-white-checkered finish to win the Toyota/NAPA Auto Parts 150 presented by TriCo Welding Supplies at All American Speedway. Partridge’s third win of the season in the No. 9 Sunrise Ford/Eibach Springs/Lucas Oil Ford wasn’t enough to catch Gilliland, who won the crown by 13 points over the veteran driver from Rancho Cucamonga, Calif. 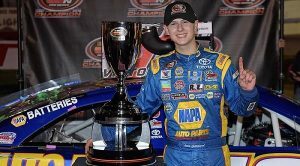 In the process, Gilliland became the youngest champion in the history of the NASCAR national or touring series at 16 years, 5 months. 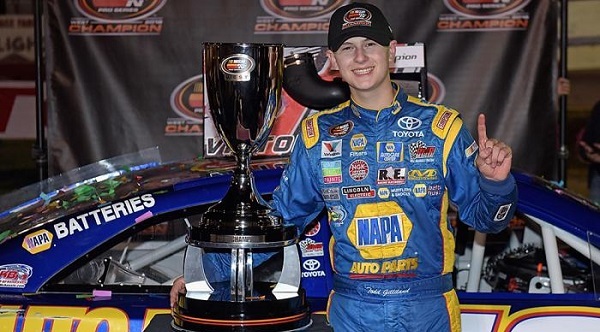 Gilliland breaks the record set last month when Cayden Lapcevich won the NASCAR Pinty’s Series championship in Canada at 16 years, 10 months, 16 days. They both eclipsed the previous mark by 2015 Daytona 500 winner Joey Logano (Logano was 17 years, 3 months, 28 days when he won the NASCAR K&N Pro Series East title in 2007). It was just the latest NASCAR historic mark Gilliland matched or eclipsed in his first full season. Gilliland’s six victories matched the win total posted by Greg Pursley (2011), Brendan Gaughan (2001) and Doug George (1995) as the most in the NASCAR K&N Pro Series West since Jimmy Insolo won nine in 1978. Gilliland joins Scott Lynch (2003) and Lance Hooper (1996) as the only drivers to win both the Sunoco Rookie of the Year title and the championship in the same year. The NASCAR Next driver’s championship title also marks the second consecutive title for owner Bill McAnally, as well as McAnally’s seventh overall NASCAR K&N Pro West championship. Gilliland joins Eric Holmes (2 titles), Brendan Gaughan (2), Sean Woodside (1) and Eggleston (1) as NASCAR K&N Pro West champions for Bill McAnally Racing. Gilliland lost the championship points lead to Partridge halfway through the season after being caught up in a first-lap wreck at Sonoma Raceway and finishing 24th. But he reeled off three straight wins to take the top spot back and he never relinquished it down the stretch. Partridge was fastest in both practices Saturday morning at All American, and started on the front row after rain washed out qualifying. He dominated the evening’s race, which was delayed several hours because of the weather. Noah Gragson finished fourth and Nicole Behar fifth. Gilliland opened the season with a win at Florida’s New Smyrna Speedway in the NASCAR K&N Pro Series East, and his seven total wins surpasses the mark set by Logano (2007) and Dylan Kwasniewski (2014) of six NASCAR K&N Pro Series wins in a season since the East and West went to a unified rulebook in 2003. Gilliland started his winning ways in the 2015 K&N Pro Series West finale at Phoenix International Raceway, and in winning his first four career NASCAR K&N Pro Series starts, he matched the record set by International Motorsports Hall of Famer Dan Gurney. Gurney won the first four NASCAR Pacific Coast Late Model Series races he entered. The Pacific Coast Late Model, which began in 1954, has evolved into the current NASCAR K&N Pro Series West. The third-generation driver also joined his grandfather as a NASCAR champion. Butch Gilliland won the 1997 West crown, while Todd’s father David had his best series points finish of third in 2009.